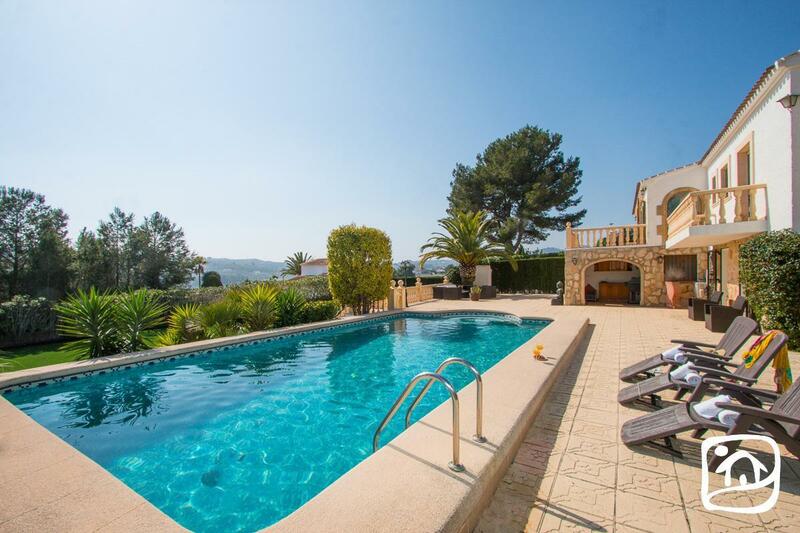 Villa for rent Javea. 2.600(/m)€. 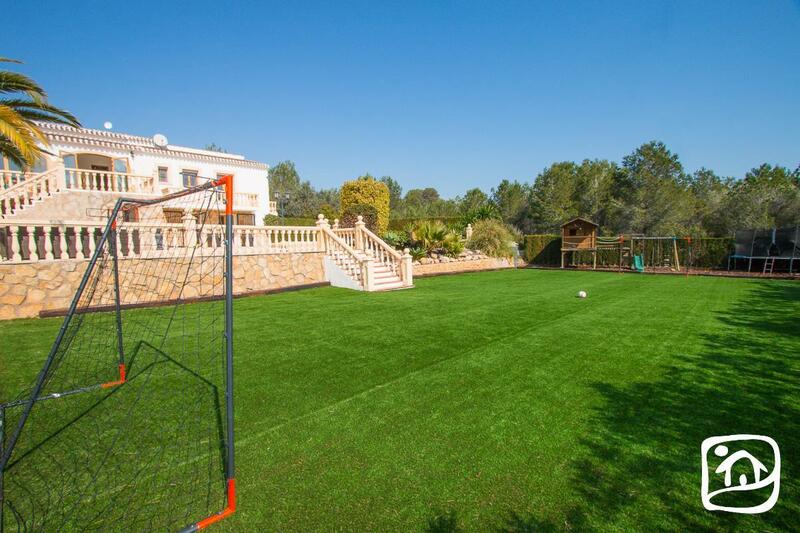 IMMACULATE VILLA FOR RENT IN JAVEA/BENITACHELL (COSTA BLANCA) WITH PRIVATE SWIMMING POOL AND FOOTBALL PITCH. LAY OUT : This huge villa is spread over two floors connected by an inside and an outside staircase. Due to the large built area (450m2) all the rooms are generous and spacious. The living room counts with comfortable leather sofas, fireplace and a massive TV. Next to it is the wonderful dining room with a great wooden table in the middle of the room just under a crystal lamp. Through an arch we’ll go to the fully equipped kitchen : two doors American fridge, central island with gas plate and large work surfaces, the best for people who enjoy cooking. There is a laundry where are the washing machine and the dryer. There are two bedrooms on that level, one with sofa, two single beds, TV and ensuite bathroom with bathtub and the second one with double bed and en suite bathroom with shower. Finally we have a large glazed space with opened views to the mountain, in which we find another dining room, a very nice seating area and an audio system. On the bottom floor there are one bedroom with TV, double bed and en suite bathroom (bathtub plus shower) and two more communicating bedrooms with a single bed (to get to one of these bedrooms we will have to cross the other). On this floor are also another bathroom with shower, a gym (equipment not included) and a movie theatre. EXTERIOR : The access to the property is by an automatic gate. There is enough space to park a few cars. The 2500 m2 plot has different terraces all over it. On one of them is the private swimming pool with sunbeds, garden furniture and a gas barbecue. Under this level is a considerable area where are the football pitch, a trampoline, a swing and a cute wooden house with a slide for the small ones. A beautiful area where the kids can play and enjoy their vacation. 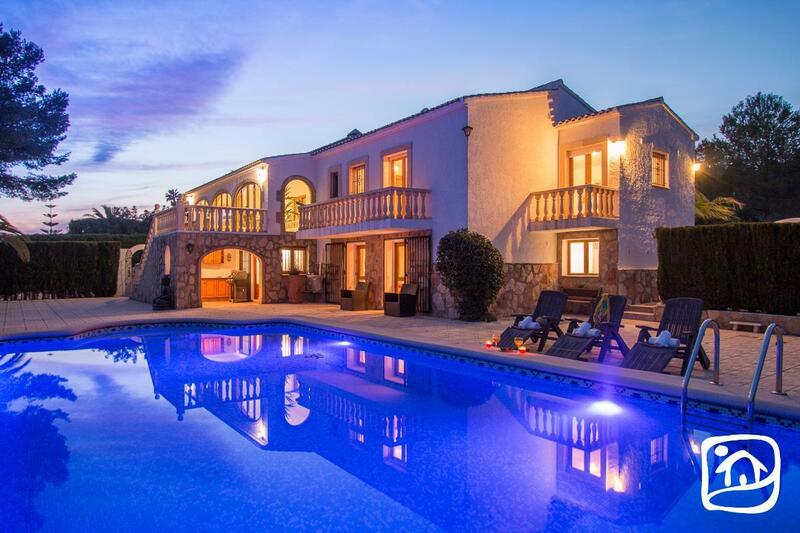 LOCATION : Located in quiet area at only a few minutes from Benitachell and the famous coves of the Cumbre del Sol. We are at 7 kilometres to the sandy beaches of Moraira and Javea.